Back on Day 92, we featured Nine Nights of Music, a Tuesday night free concert series brought to you by the Minnesota History Center. Well, this Tuesday, July 20 that series will bring you a Beatles Tribute from local cover band RetroFit. 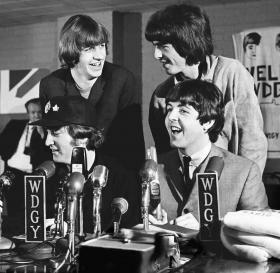 Starting today at the Minnesota History Center, the new exhibit is The Beatles: A One-Night Stand in the Heartland. The exhibit will be on display daily until September 12th of this year. In August, 1965, a 17-year-old local photographer documented the Beatles’ only appearance in Minnesota. Bill Carlson’s images are the focus of this new exhibit, including photos of the band’s arrival at Wold Chamberlain Field, the mobs of girls waiting to greet them, their press conference and performance at Met Stadium. This is the first major exhibit of the images, some of which have never been published. Many of the images are taken from Carlson’s book of the same name. On Tuesday, there will be a free celebration of all things Beatles starting at 5pm. There will be a reception and book signing by Bill Carlson until 8, a Sgt. Pepper album cover photo opp until 9 at which you can pose with the Fab Four, and you will have an opportunity to play Beatles! Rock Band until 8:30. RetroFit will be rocking all your fave fab Beatles jams on the outdoor plaza from 6:30 to 8:30, and there will be an Intermission Costume Contest–Dress in your best Beatles inspired outfit for prizes, paparazzi and screaming fans! The exhibit will be open for viewing during regular museum hours: 10am to 8pm Tuesday, 10am to 5pm Wednesday through Saturday, and noon to 5pm Sunday. The museum is closed Monday. Admission prices are $10 for adults, $8 for seniors (65+) and students (with valid ID), and $5 for children ages 6 to 17. The Minnesota History Center is located at 345 W. Kellogg Blvd. in St. Paul. For more information on the exhibit, Nine Nights of Music, or the Minnesota History Center, visit minnesotahistorycenter.org or call (651) 259-3000.